The Masters, one of golf's most hallowed tournaments, has come and gone for another year. And while everyone knows that Bubba Watson won the tournament, the arguably bigger question surrounding this week of high-stakes golf remains unanswered: Will Augusta National, the all-male country club that hosts the annual match, invite IBM (IBM) CEO Ginni Rometty to become a member? This isn't the first time the issue of admitting women into Augusta has reared its head. The National Council of Women's Organizations tried to get the club to change its membership rules in 2002 by threatening a boycott. Back then, the club dug in its heels, running the tournament without sponsors for two years. This time, Augusta has not just its reputation on the line, but big dollars, too. IBM is one of the Masters' traditional sponsors, and Augusta National has asked the company's last four CEOs to join its membership ranks. Those last four CEOs have all been male. 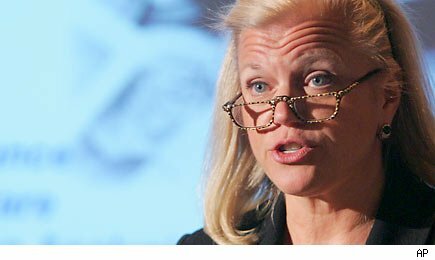 But on Oct. 25 of last year, the board of directors elected longtime IBM executive Ginni Rometty to be CEO, replacing the highly regarded Sam Palmisano in the position. Rometty came to the company in 1981 as a systems engineer and rose steadily through the ranks, ending up as Palmisano's top lieutenant. She's generally recognized as being instrumental in helping Palmisano reinvent the company -- turning it from an increasingly irrelevant personal computer and printer manufacturer into the global consulting-services powerhouse it is today. But none of Rometty's accomplishments matter: In the eyes of the Augusta National Golf Club, Rometty is lacking in one key membership requirement -- Y chromosomes. For the moment, IBM is remaining tight-lipped on the Rometty/Augusta matter, and the only thing the nation's most prestigious country club will offer is that its "membership decisions are private." So now Augusta finds itself in the uncomfortable position of potentially snubbing the CEO of one of its most high-profile and stalwart sponsors -- not a small issue considering the economic challenges the country is facing and the cost of running an event like the Masters. IBM finds itself in an equally perilous position: Can one of America's reigning corporate titans -- a company that has miraculously remade its name as a progressive, forward-looking organization -- let its brand-new CEO be publicly snubbed with no bold response or defense of any kind? Arguably, IBM wouldn't even be where it is today if it weren't for Rometty. What Message Will IBM Send to the Female Workforce? Brand damage, and the potential financial repercussions, for the 125-year-old company should be at the top of the list of concerns facing IBM's board right now, and the Augusta issue puts IBM in a tough spot. How is the company supposed to attract employees if there's an obvious glass ceiling for being the wrong gender? And, depending on how this pickle plays out, how will it affect morale for any of the female employees currently at Big Blue with aspirations for moving up the corporate ranks? It should be noted that Rometty plays golf. And since so much business is still conducted on the links, her being kept out of Augusta National is more than just an academic issue. Playing golf with the boys at IBM probably helped Rometty get where she is today. To be snubbed by the most important country club in the nation after benefiting so much from the game must be gallingly ironic for her. There's no doubt that both sides are heatedly debating what to do right now, but the most potentially damaging aspect of this controversy is that it's happening completely in public. Both organizations have their good names at risk in the situation, and the longer it goes without a resolution the worse -- and more intense -- the publicity will become. If the old boys club doesn't come through for Rometty, IBM needs to consider pulling its sponsorship from future events. As any professional touring golfer will no doubt attest, the pressure at Augusta is always intense, but this year -- even with another Masters in the rear-view mirror -- the stakes are even higher. Motley Fool contributor John Grgurich owns no shares in any companies mentioned in this article. NEXT: America's 10 Highest Paid CEOs: Which Are Worth the Money?